How Do Facebook and Technology Influence Child Behavior? I am enrolled in the New Media MA at the University of Amsterdam. I have a BA in American Studies and Swedish and an Msc in Marketing and PR. My area of interest is advertising I am very interested in how New Media can be used to increase brand awareness, develop online projects and online advertising. At the same time, I am also interested in social media and how they facilitate crime and identity theft. When I was growing up in the early 90s there was no such thing as social media. We had never heard of Facebook, Twitter, Hi5, Google+ or MySpace, reason for which we spent all of our free time interacting with real people, talking and playing with kids our age, eventually building an active social life and strong bonds. Therefore, my question is: how are social media affecting our social behavior? I have started giving this a lot more thought, since I read an article in the New York Times entitled How does technology affect kids’ friendships? I have noticed that nowadays young people do not have real friendships. What is there behind all the social games and the funny wall posts? Sure, your Facebook friends list counts hundreds, maybe even thousands of people, but how many of these are you actually friends with or talk to on a regular basis? Are there among them any which you have never met? When I first became interested in social media I created a Hi5 account in 2005. Back then, Facebook was not as popular in Romania as it is now; just a quick parenthesis here, I really do not believe Google+ will ever dethrone Facebook in Romania. I was so excited that you could interact online with so many people, that I kept adding and adding “friends” until I reached the limit imposed by the provider. However, now that I look back on this episode, I did not know even 50% of the people I was virtually friends with. In my opinion, that makes us a bit superficial: we wish so much to be popular and interesting online, when in fact we are quite shy. I guess that is a positive characteristic of social media: you are braver in having conversations you would normally avoid when face-to-face with the person. 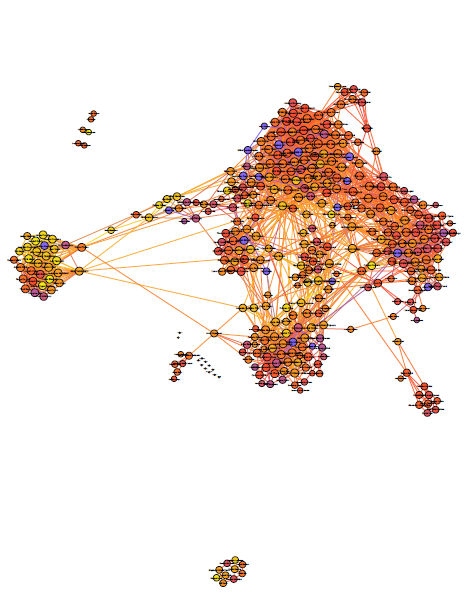 For fun, this past week I used Gephi to analyze my Facebook friends list and I was shocked: it counts 387, out of which probably only 15 are real friends I spend time with offline. Also, there are some groups of friends completely isolated, no links whatsoever. Although I promised myself I would stop adding people I do not know, I noticed that there are some that I rarely or never talk to. So what is the point in having hundreds of so-called friends on Facebook, if in real life you cannot count on them? Are we more interested in human to computer interaction, rather than the face-to-face old-fashioned one? How is this affecting teenagers in building healthy, real relationships? According to the New York Times article I have mentioned earlier in my post researchers at Pew Research Center discovered that in 2010 in the United States children between 8 and 18 spent 7 1/2 hours using computers and telephones, sending an average of 100 texts per day. Out of the researched children only 33% communicate with their friends face-to-face. This is quite alarming, since you would expect them to be more interested in Disney movies and making sand castles. Although children are computer literate from a very young age, I think it would be very interesting to start a survey targeting teenagers on Facebook and Twitter to understand where the obsession with social media is coming from, but at the same time how it has affected, in time, their offline social network. I would simply ask them to be honest and answer some easy questions, for example: When was the last time you went to the park with your friends? Do you ever talk to your friends on the phone? How often? How many friends from your list do you speak to or interact with? How many of them do you actually know in person? I would gather up all the information to make a chart of the answers, which I would try to split into one word categories like yes, no, never, rarely and so on. I am very curious how many would give a negative answer. I believe that in the case of young children and teenagers, likewise, Facebook actually has a negative influence, because the internet does not allow them to actually be free, so to speak, but it cages them up, behavior-wise. It diminishes their abilities to be friendly in real life, to understand body language and funny faces, without using the emoticon to express how they feel. We might go as far as saying that social media isolates them from a normal childhood or a normal behavior. I would like to carry out this research on two categories of children: the first would be from a Western, fully-developed country (US, UK, Germany, and so on) and the second category would be from the Eastern bloc (Romania, Bulgaria, Serbia, and so on). Since in this part of Europe the rural areas are not connected to technology, I would focus only on the cities. In my case, even though I was in college when I started using Hi5, Facebook, MySpace and Last.fm, I have to admit that Facebook has made me lazier in terms of keeping relationships offline. There are people I have not seen in 5 years, yet on Facebook we are friendlier than ever. I would like to mention I do not even have their phone numbers in my address book. However, I am probably not the best example, because Facebook has not really influenced my childhood that much, yet it has affected some of my offline friendships and has made me truly addicted to it. I would like to conclude by saying that in no way do I consider social media a negative aspect of our lives, I think it is extremely useful in keeping in touch with old colleagues and friends from abroad, but at the same time I think children should be protected from the computer and technology in general at an early age or wait until they are older to introduce them to so much technology, at least until they have developed some interpersonal skills. Stout, Hilary. “How Does Technology Affect Kids’ Friendships?.” The New York Times. The New York Times Company. April 30 2010. Web. October 2 2011. Interactive Media Artworks for Public Space: Does Art Hold the Potential to Influence Consciousness and Behavior in Relation to Public Spaces? One Laptop Per Child; Is That Enough? Discourse network 2000 Does technology influence what we write?